I was late for class, didn’t have the correct security card to pass through the door and arrived sweating and out of breath. There were 5 learners waiting for in the class, some new and looking sheepish, though probably not as nervous as me! I brought some large yellow index cards and markers to make the syllabus. First I explained that we were not going to use a textbook in the next course and that as an experiment I would like them to come up with ideas for what to do in class. 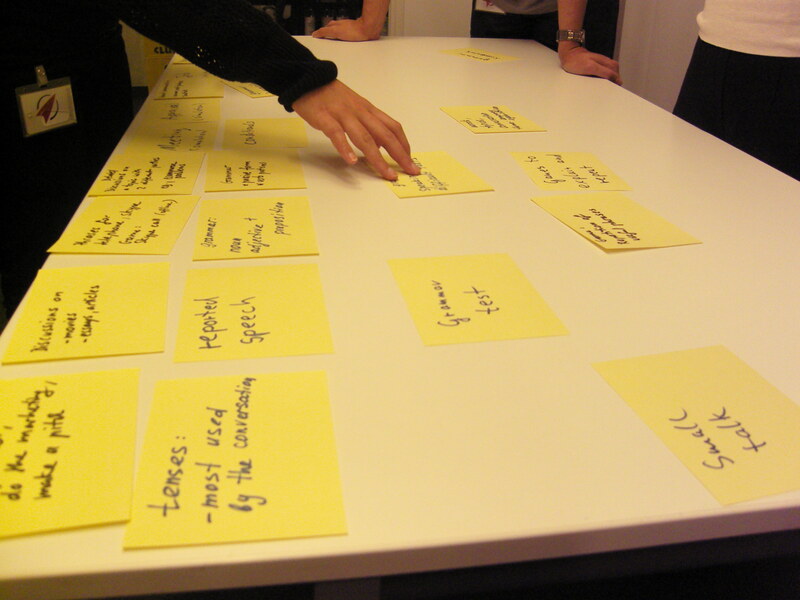 Then I asked everyone to brainstorm what they would like to have in the next course – which would last 12 weeks. Why did I choose 12 weeks? Well, for the learners this is long enough to look back and evaluate progress and from my point of view, it helps me to plan ahead and think about the broader aims of the course. After the brainstorm session, the learners then wrote down their preferences on cards. We then placed all these cards on the table and I asked them to organised the cards into weeks, from Week 1 to Week 12. To start with, the first few weeks were overloaded e.g. 2 or 3 separate grammar points and a reading with discussion. I told the learners that we’d only probably get through two separate activities in a lesson, as well as revising material from the last lesson. You’ll notice that there’s a lot of grammar here! 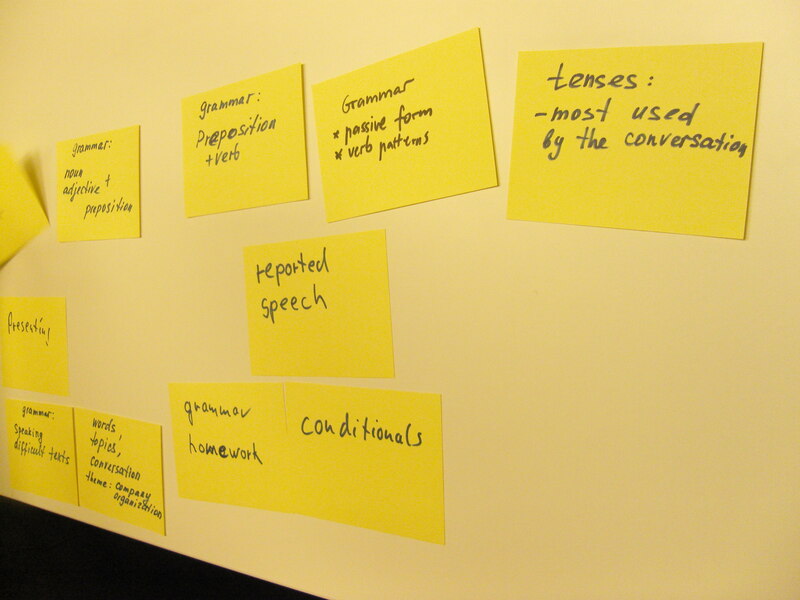 There was a new learner in the group that night who requested a lot of grammar items. We actually spoke after and she said that this class was a very different way of teaching from what she had experienced before, which was based on a lot of grammar instruction and rote memorisation. So that is one reason why grammar is well-represented (though other learners chose grammar items also). But no problem – you can’t have a democracy and then complain about the result! 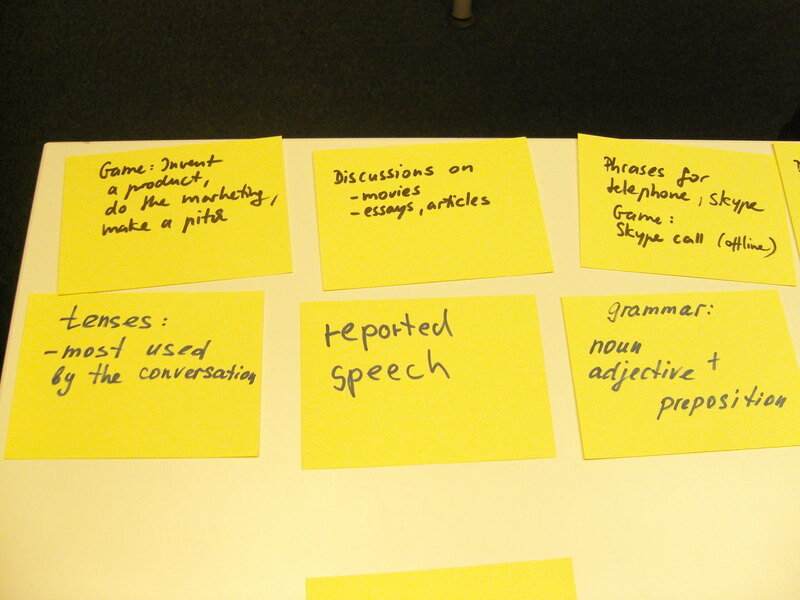 Grammar items were not the only topic requested by the learners and there was also a good mix of other activities, like ‘Invent a Product’ and ‘Discussions on Movies, Essays, Articles’. The learners also chose some activities that they wanted repeated in every lesson, which included Games (for revising language), Useful Phrases and Small Talk. One thing which I wanted to include were my suggestions for the next 12 weeks, but this completely slipped my mind because I was late and rushing to class! So, syllabus done (click here to view) – we’re off to a flying start! Please write if you have any comments, and also share with any interested parties! Paulio , brate , this is great. Can I pick your brains, though ? How did you steer them to choose the topics ? I started a ‘speaking course’ a couple of weeks ago where they know there won’t be any book, test, homework etc. I asked a couple of questions for needs analysis to keep it simple ‘What topics do you NEED to speak about in English ?’ and ‘What topics would be FUN to speak about in English ?’ , gave them time to work it out in pairs if necessary (they’re B2 level officially) so as not to put them on the spot.. and basically the answer from everyone was ‘ We don’t mind what the topic is, we just want to practise our English.’ . Of course, this isn’t actually true- they clearly have a preference for some topics over others- but weren’t used to having the choice or , in other words, the teacher not choosing. I was a bit surprised as I thought having chosen just such a course they wouldn’t expect to be spoon-fed so much.. but I was wrong. Otherwise , they’re a nice class and try hard to sustain conversation in most activities (which they don’t find easy, actually,despite their incredible knowledge of vocabulary and grammar) . Great to hear from you! You raised a serious problem. I’ve asked learners before, in previous classes, about what they would like to do and the response is: ‘well, we don’t really care – you’re the teacher!’ I think this is primarily due to the cumulative effects of long-term coursebook addiction, having very little autonomy and teacher-centred classrooms. And to some extent, they’re paying for you to be the boss. Weaning them off this is difficult! With my learners I’d been preparing for a long time beforehand. We used the coursebook very sparingly and I often did little activities as tasters – like doing word games at the start of class to revise vocabulary, using scrap paper to write down short business dialogues. But context is also key here. My class use English in their daily work, and they really are like magpies when it comes to ‘Useful Phrases’, as they can use them the next day at work. This is often the advantage with teaching Business English. With learners who have no real immediate need for English, as I see it you have two choices. You could try and get them to talk about what they like to do in their L1, or in their home country, explore and present their L1 world in English. Or you ‘bring English to them’. Having a native speaker as classroom visitor would be motivating, or working on a movie clip from an English speaking country. Or they can interview you about your life as a teacher (including any embarassing moments)! Steam Transport (http://www.streamtransport.com/) is also a great tool for downloading up-to-date news videos from websites – perfect for sparking off discussions. Jamie Keddie also has a great site with lots of video lessons (e.g. http://lessonstream.org/2013/06/11/gezi-park/). I’ve used TBL lessons with a lot of success, see free downloads from Jane and Dave Willis’ site (http://www.willis-elt.co.uk/taskbased.html). I’ve always wanted to do the lesson ‘How strict were your parents’, it sounds great. From the learners point of view, it’s often easier to say what you don’t want to do, then start from a ‘tabula rasa’. It’s like being in a restaurant – you probably wouldn’t know what to order without seeing the menu. You could write down a list of activities, themes, topics on Index cards (including a few sneaky ones that you know they won’t like e.g. spelling test). Then they might be more eager to take some control. Then, once you’ve made it clear what they do want, give them some extra blank cards and say, ok, there’s 2/3 lessons that I want you to organise yourselves. All you need is a foot in the door to start with, I would say. With the first iteration of your speaking group, you might provide 70/ 80% of the syllabus, but perhaps at the end you can get them to take on more responsibility. With the next course, it might be 60/40. Good luck with your speaking course, let know how you get on! I think you’re exactly right with the comparison about the menu. Probably I’m thinking too much from a teacher’s point of view by asking for ‘topics’ out of the blue: it’s us teachers who think in terms of lists of possible topics, not learners: Considering possible topics of conversation is just not something most people would do consciously in real life.. There was also definitely an element of ‘You are the teacher, you decide ! ‘ too, which I have seen before. Most of the class are doing really well and try to make conversation about whatever is given to them (One lady had asked for festivals and customs: this clearly wasn’t that interesting for everyone in the class, but in lieu of other contributions about topics from others, I tried to do something with it) . I suspect these are the ones who’ve chosen a ‘speaking course’ with an awareness of what that involves. Others have been steered towards it by the school management for other reasons- they were too late to register for normal courses or those courses were full (we start speaking courses half way through the term as they’re six weeks rather than twelve) -or they have found themselves unemployed as the tourist season ends, once again in the middle of the normal term. After a sticky start on Halloween and festivals, with some pairs making great conversation and others clearly disinterested , I got them to make a ghost story from keywords from an original Edinburgh ghost story ‘The White Lady’ , which worked extremely well.. We did ‘The Jazz Festival’ from In-company Case Studies: that has never failed yet and I would like to recommend the authors for a knighthood ! After the buzz from the ghost story and Jazz Festival decision-making game, I felt ready to push them a bit more about topics. We got ‘job interviews’ .. which is fine, …’Dealing with difficult clients on the telephone’,,but then ‘ Writing a motivational letter’ , ‘writing a letter of complaint for general Ielts’ …. Er, this is a SPEAKING course ??!! An interesting ‘experiment’, which I’m tempted to try myself. It looks as if though this type of instruction was rather chaotic and haphazard, but I believe it actually needs a lot of thinking and preparation. I’m not convinced, though, that the students can ‘just’ choose what they want to learn and do in the course. The teacher should lead them in some way. It’s as if a doctor asked a patient with a terrible migraine how she or he would like to be treated. I think a combination of centralized and decentralized instruction might work best – the teacher suggests the content based on Ss’ needs analysis but the final decision is up to them; and maybe some kind of take turning (T-Ss, Ss-T). Anyway, I’ll follow your steps to see how it works in reality. Good luck. Thanks for your comment! Sorry for delay in replying, better late than never. Firstly, let me turn your observation on its head – “I’m not convinced, though, that the students can ‘just’ choose what they want to learn and do in the course.” I think if most people think back to their schooldays, they can recall a really boring, or awful teacher. In that situation, a common response is “I’m not learning this, it’s useless/ boring/ get me out of there!”. In a geography lesson, with a particularly sadistic teacher, I remember having to memorise all the counties of England, their capital towns and major rivers! During the class there was total silence, with any hint of rebellion quashed with by the staring eyes of the teacher. So, I (and lots of others) just chose not to learn in that environment. Even in the most centralised environments, what is taught and what is learnt can be worlds apart. Also, I think there’s a big difference between the doctor/ patient and teacher/ student relationship. When I’m really sick, I can’t just stay at home and make myself well. But there are students, lots of them, who learn without a teacher – even language learners! Also, there are degrees of skill involved in learning – some learners are better than others, whereas with a patient this doesn’t apply. But I agree with your point about balance. Of course, depending on the context, a balance of Decentralisation and Centralisation might be the best way to go. This is one of my main points. But I do think that the ELT industry is skewed towards Centralisation. This entry was posted on October 28, 2013 by paulwalsh in DCT in action, For Teachers and tagged Action, Decentralized Teaching, Exploration, Grammar, Implementation, Learner, learning, negotiated syllabus, Reflection, Syllabus.